Heeding Marcel Duchamp’s hope, expressed in a 1946 interview in the Museum of Modern Art Bulletin, that future artists would ‘…put painting once again at the service of the mind,’ British artist Tom Hackney has created a new-millennium style of geometric abstraction based on the grid and executed following tenets of process art. Tom Hackney: Chess Painting No. 64 (Duchamp vs. Znosko-Borovsky, Paris, 1929) (2015). 42 x 42 cm. Gesso on linen, oak frame. Image courtesy of the artist. Like American artist Sherrie Levine did in the Lead Checks game-board works she began in the mid-1980s, Hackney has sought a fresh, conceptually-driven, yet personal approach to grid painting. While Levine’s works suggest the general universe of gameboard / grids, Hackney has chosen to inexorably fuse the process of painting with the playing of chess via his grid/board canvases. He has done so by following the chess notation of specific games played by Duchamp against a variety of opponents to determine the painting sequence and the value and/or color of each grid square. In his debut exhibition at Francis Naumann Fine Arts in New York, Hackney presented eighteen of these square 8 x 8 grid format works on stretched linen. The 32 x 32 cm and 42 x 42 cm format pieces relate directly to the sizes of standard chess boards, while the 66 x 66 cm pieces mimic the standard wall-hung chess demonstration boards readily found at any chess club, or seen on the wall in photos of Duchamp’s studios. Thirteen canvases have been executed with layers of black and white gesso while the other five works were done with layers of translucent oil paint. Duchamp would certainly approve of the economy of means and materials with which they have been produced. In works where black opposes white, Hackney has painted in sequence from first to last moves. Each square becomes one shade darker if occupied by a black piece and one tint lighter if subsequently occupied by a white piece. Building up individual layers, each as delicate as a passage in a late Ad Reinhardt or Agnes Martin work, Hackney arrived at works as bold and graphically dynamic as a Franz Kline canvas. In his colour works, Hackney has used the colourcode system of Duchamp’s unrealized 1920 Chromatic Chess Set. Opposing Kings and pawns are white and black; Queens are light or dark green; Bishops light or dark yellow; Knights light or dark red; Rooks light or dark blue. The artist found that in these canvases the richest results were arrived at by playing/painting the games from last move backwards to the first move. This reversal is a gesture of combative collaboration with Duchamp who held that ‘there is a mental end implied when you look at the transformation of the visual aspect to the grey matter … [It is] what always happens in chess and what should happen in art’ (A Discussion of Marcel Duchamp’s Views on the Nature of Reality and Their Relation to the Course of His Artistic Career , p.8). For Duchamp, an artist who wanted to ‘eliminate the retinal’, and transform ‘…the visual aspect to the grey matter’, Hackney has generated paintings that also function like composited black and white X-rays or colour digital brain scans. Built up layers of chromatic topography, they have precisely mapped the moment by moment calculations and decisions made not by one, but by two brains, those of the opposing players. As such, they are compellingly intimate mental portraits of Duchamp at moments of his most highly focused creative interaction with others. Hackney’s paintings operate as a group of conceptual, thematic ‘bookends’ to Duchamp’s numerous 1911 studies for Portrait of Chess Players, one of which, Pour une partie d’échecs (For a Game of Chess), literally has the contours of the two players’ heads overlapping and entangled with each other and filled with chess pieces and the gestures of moves. As in these drawings by Duchamp, Hackney’s mappings of players engaged in combative chess collaborations result in vibrant works of art. Hackney entitled his exhibition Corresponding Squares: Painting the Chess Games of Marcel Duchamp, alluding to the scholarly, esoteric endgame book Opposition and Sister Squares Are Reconciled that Duchamp produced in 1932 in collaboration with Grandmaster Vitaly Halberstadt. In this book, ‘sister’ or ‘corresponding’ squares must be equally mirrored to be reconciled in endgames. In his exhibition, Tom Hackney has achieved a rare creative balance by which painting exactly corresponds to or mirrors chess. Each is reconciled with the other as seldom before. In these works, Tom Hackney succeeds in uniting the disciplines of painting and chess as co-equal partners in their creation. 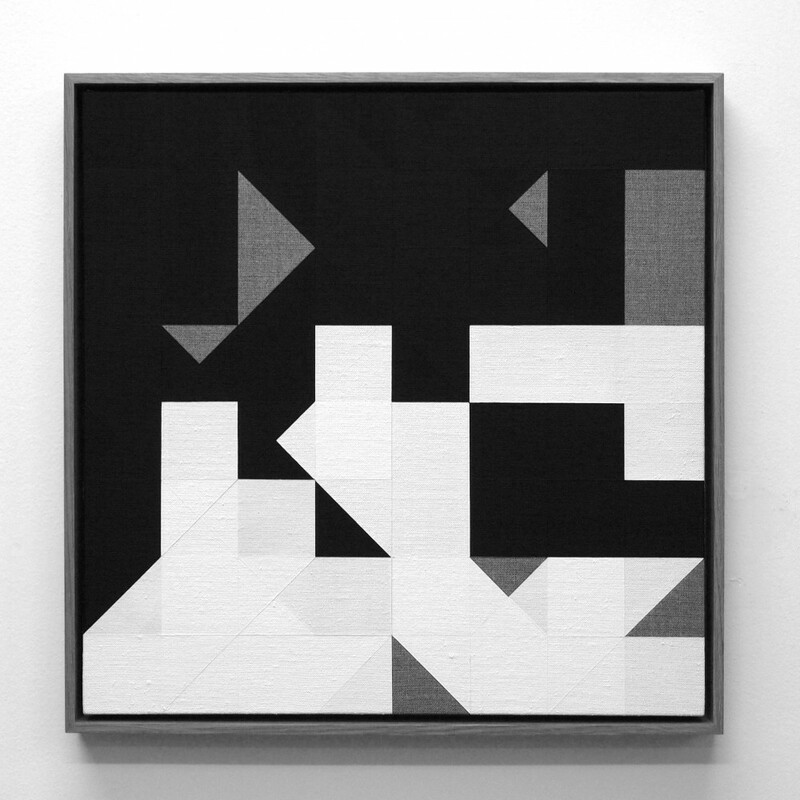 Corresponding Squares was on view at Francis Naumann Fine Art, New York 18 March – 29 April. With the addition of four more related canvases, the exhibition moved to the World Chess Hall of Fame, Saint Louis, Missouri, where it was on view 19 May – 11 September 2016. Larry List is a New York-based independent curator and writer. His most recent project was Man Ray & Sherrie Levine: A Dialogue through Objects, Images and Ideas for the Jablonka Mauriani Mercier Gallery, Brussels. Text copyright Larry List. First published in Enclave Review 14, Summer 2016, p.16.